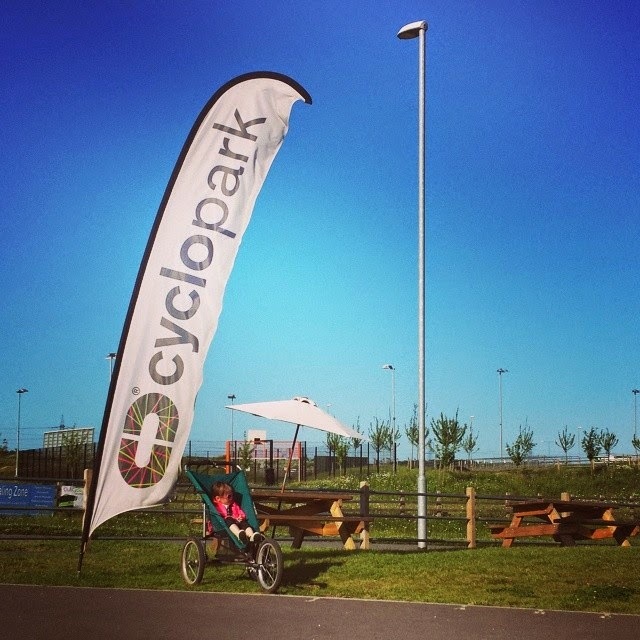 I wouldn't usually write a blog post about the 5k cyclorun, which takes place at 8am on Sunday mornings at the Cyclopark near Gravesend in Kent, but on this occasion it was special. Instead of turning up for a normal run, I took my daughter and our running buggy. After two years the time had finally come to do a proper buggy running time trial effort. The goal was to try to run under 20 minutes, and I was confident that I could get close... on a flat course. However, the cyclopark track is not completely flat. It has undulations most of the way around and I wasn't quite so confident that I could break the magic 20 minute barrier. So on Sunday 8 June 2014, we lined up on the start line with 14 other runners (including another buggy runner). At 8-something sharp we were sent on our way to complete the two-lap course. I started politely (that means that I gave the other runners some space and didn't crash into anybody with the buggy wheels) and after 50 metres or so, the runners fell into their desired paces and positions. We were in third position at this stage and we stayed close behind the runners in positions 1 and 2 until just before the 1 kilometre point when we edged into the lead - which is where we remained for the rest of the run. We completed the first lap in 9.49 - within the time window for running a sub-20 time, but I was exhausted. I pushed (pun intended) as hard as I could around the second lap, but I knew I was a little slower than the first. The last kilometre of each lap is largely uphill, and as we ran up the incline towards the finish on the second lap, it was as if the finish line kept getting further away - a feature of this course! My daughter was loving every minute of it, and I usually talk to her as we go around, but at this stage of the run, and at this pace I just didn't have enough puff to talk and run at the same time! Finally we crossed the finish line and I instantly parked the buggy and sat (or fell in a heap) on the floor to recover. I was in complete agony during the last incline and was relieved that it was all over. I had stopped my watch as we crossed the finish line and I now had a chance to look at it. It read 19.49, this was followed up by confirmation from the official timer that I had indeed run a sub-20 buggy run. The second lap had indeed been slower than the first (10.00), but we still managed to keep it within the buffer zone. Over the moon, we took the buggy back to the car, packed it away and then went to the cinema to celebrate our first sub-20 5k buggy run! We're now on the look out for a flat course to see how much faster we can go.